"Losing the Nobel Prize", by Brian Keating. There are few awards that match the prestige and grandiosity of the Nobel Prize. Four years ago, a team of researchers announced a breakthrough discovery that, if true, may have put them in strong contention for that premier medal. On March 17, 2014, researchers announced at Harvard University that the BICEP2 telescope had for the first time detected evidence of a very brief accelerated expansion during the early moments of the universe. But the amazing announcement, whose broadcast was viewed by millions of people, wouldn't hold up. Early the following year, another group of scientists revealed that interstellar dust was actually the cause of more than half of BICEP2's signals. 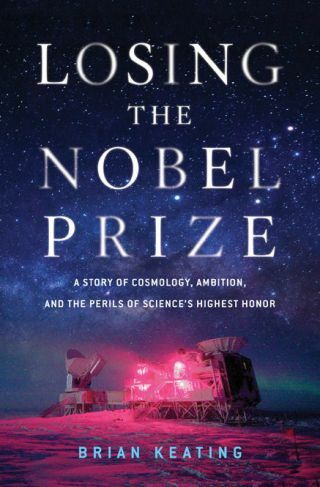 A founding member of the BICEP2 team, Brian Keating, documents the rise and fall of the experiment, and the limitations of physics' top honor, in his new book, "Losing the Nobel Prize" (W. W. Norton and Co., 2018). Space.com: How did you feel when you found out that the BICEP2 results were wrong? Brian Keating: It was devastating at first. To work [on] an experiment for the better part of a decade, only to have our final results retracted was a blow that seemed insurmountable ... Yet, in time, the pain subsided and we all got back to work. Some of us regrouped and began work on BICEP3. Others beat telescopic swords into plowshares by working with former "competitors" in the hunt for inflationary B-modes [twisting patterns in the polarization of the Cosmic Microwave Background]. These included experiments like Planck, POLARBEAR, and the South Pole Telescope. Still others, like me, began preparations for the next generation of Cosmic Microwave Background experiments — the Simons Observatory. Failure isn’t fatal; pain isn’t permanent. But to heal, we quite literally had to dust ourselves off and throw ourselves back into the arena. Space.com: Can you talk a little bit about how personal incentives can alter what you as a scientist end up doing? Keating: Scientists are humans and all humans have biases. They could have implicit biases, explicit biases. And then there's confirmation biases and authority biases. In the case of scientists like [Big Bang skeptic] Fred Hoyle and Galileo Galilei, and many, many scientists, including me and my project BICEP2, we were desperately desiring to see the signals that comported with our sense of the way the universe should "work." In the case of Galileo, he was subject to the forces of wanting to desperately establish an authority (Copernicus) and confirm the model that Earth went around the sun, which is correct. But Galileo kept seeking confirmation of what he already believed. He claimed that the tides of Earth's oceans were caused by the Earth rotating around the sun and sloshing, because he wanted to further support the Copernican model … In the case of Fred Hoyle, he didn't believe in the Big Bang… He, too, was brilliantly right about how stars could form elements. But he took to the grave believing that the Big Bang was wrong. And then in our case with BICEP2, we desperately wanted to see inflation signals of gravitational waves, and we did so at such an extent that we were willing to suspend the best practices of science and how you're actually supposed to treat data. In reality we were victims of the same blunder, of that same confirmation bias. And the lesson is, be careful. Check your biases because a lot of times they can lead you down a path of something that's wrong. You really have to be humble. We had a lot of hubris and that was to our peril. The villain of my project was dust. And we're not all past this hubris that we have as sentient cosmologists that we are somehow superior to a humbling substance. So I think if we can have humility, recognize that we do have flaws that we do have foibles and to guard against that, we can build in checks and balances … Go out to where the data leads you. This image from the European Space Agency's Planck satellite shows the space observatory's view of the same region observed by the Antarctica-based BICEP2 project. The Planck data suggests that light patterns that confirmed the cosmic inflation theory were actually caused by space dust. Space.com: What do you think a reader can gain from learning the stories of scientists and their vulnerabilities in other areas? Keating: From that huge theme I hope to convey that scientists are people ... the scientist stereotype also neglects their positive human qualities like vulnerabilities and emotions. A young woman read the book and told me she really wished she had the book 10 years ago because at that time she dropped out of studying astronomy, and I asked her why. She said her father told her that you're only a good scientist if you win the Nobel Prize. And it's just one of many different lessons I've heard from people around the world from tenure[d professors] to all different levels of the academic chain. The Nobel Committee has a responsibility, and if it's going to be the sole maintainer of integrity and of civilization by elevating those pursuing science and truth, then it needs to live up to a higher standard. In the book I mention there's only two more female Nobel Prize winners than there have been female popes. Women haven't won the Nobel Prize in 54 years ... there are plenty of women now who deserve it. The Horn reflector antenna, shown here in June 1962, at Bell Telephone Laboratories in Holmdel, New Jersey, was built in 1959 for pioneering work in communication satellites for the NASA ECHO I.
Space.com: You said the Holmdel project in New Jersey, where scientists, Arno Penzias and Robert Wilson, adapted a radio antenna into a telescope in the 1960s, was "a triumph of generosity over greed." Why do you admire that project so much? Keating: There were two choices during World War II for scientists: They could work on the Manhattan Project … or they could work on radar using this new technology called radio waves. And either one was a huge accomplishment. Bob Dicke's group worked on radar technology. Astronomers Arno Penzias and Robert Wilson wanted to find a place in the sky absent of microwave or radio emissions from the Milky Way so that they could calibrate [the Holmdel Horn] antenna into a telescope. But when they stared into the void, they found radiation coming from beyond the Milky Way. And they didn't know what they had found. It was serendipitous. But when they asked Dicke —the person who interpreted their findings and told them what it was —if he wanted to be the third author on the paper, which would have made him the third Nobel Prize winner, he declined it. And I thought that was pretty valorous ... I think he had too much integrity and said, No, you guys did the actual work. You made the serendipitous discovery. So, he didn't want to be seen as claiming credit for something that he didn't 100 percent own. Space.com: Could you talk a little bit about competition in science, and how you think the Nobel Prize could address it going forward? Keating: A Nobel Prize could be awarded to more contributors and could thereby recognize everyone who had an impact on an experiment. That's important. It's already being done in the Nobel Peace Prize, which can be given to groups of arbitrarily large teams. The Nobel Prize in physics decided for some reason to limit it to three people ... Alfred Nobel outlined the award to be for one [person] in his 1895 will. In the 117 years that the prize has been awarded, nobody has really addressed the problem that the number of people required to make these discoveries has gone up exponentially. Thousands of people worked on the Large Hadron Collider, many people worked on the LIGO experiment. So to say there is this great sage without whom we could never have made that experiment, this discovery, is incorrect. And, only awarding team leaders sort of rewrites how we record the scientific process. And that's bad. I propose in the book that the Nobel Prize could go to groups: Half of the award could go to the people who lead it, and the other half could go to everyone else who worked on the team. I don't think that would diminish the Nobel Prize at all. But the Nobel Committee seems to think otherwise and that's why they haven’t changed it, although the Peace Prize does do that. And another thing the Nobel Peace Prize does is notify and publicize who is nominated, not just who wins it. But in the Nobel Prize in physics, my [project's] nomination will be kept secret for 50 years, according to their rules. Space.com: One of the most moving things from the book is the story about your mentor, cosmologist Andrew Lange. Can you speak to the importance of mentorship and what he meant to you? The theme of the book is that in some sense science is a human endeavor. And scientists are fragile, they're emotional ... they have ethical quandaries and things like that as well. Mentors communicate on a human level. And that's what Andrew would do. He was a father figure to me during a difficult period of my life … and mentoring is something that we never really teach. Nor do we ever study it. You may have been really good at studying quantum cosmology and so forth, but do you actually sit down and think, you know, what's the best way to teach the ethical responsibilities of being a scientist? We could really do with more of that. I think Andrew was really an exemplar of mentorship. His loss was tragic. He left such an impact, and did so much for me and hundreds of other people. I think about him every day. I mean, he really saved people's lives and careers. He was so charming and so kind and gracious. But in the end I hope I did his legacy justice. And I hope his children will someday find the book and know at least what he meant to me. And I'm just one of hundreds. Space.com: How might teaching practices at universities influence future scientific research, in your opinion? Keating: An organization should protect the physical and mental safety of an individual: a sense of purpose, a sense of meaning, and sense of value to the organization. As Viktor Franklsaid, our search for meaning is really what makes someone feel important enough to carry out a mission. And all of our scientists have missions: to do, to create, to add to the body of knowledge that human beings have accumulated. This interview was edited for length. You can buy "Losing the Nobel Prize" on Amazon.com.